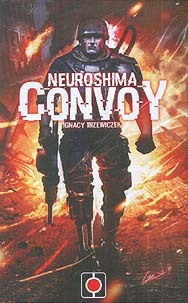 CONVOY is a two player card game set in a post-apocalyptic world of Neuroshima, known for such games as Neuroshima Hex, 51st State, and New Era. CONVOY is an asymmetric game - one player commands the themed convoy of powerful Moloch machines heading towards New York. Their goal is to reach New York and turn it into ashes. The other player commands the forces of the Outpost guerillas. Will the New York City survive? Will the Outpost soldiers manage to stop the march of merciless machines?